The Output Control run options set the information and frequency of information written and saved to the various MODFLOW output files (see following figure). The binary files contain head, drawdown, and flow exchange values for each grid cell, while the ASCII listing file contains all relevant information on the operation of MODFLOW, and the simulation results. The listing (.LST) file is useful if errors occur during a simulation and you want to know how far MODFLOW progressed, or if you want to examine head or drawdown values at given intervals. For a steady-state simulation, only one set of values for each grid cell are written to these files. However, for transient simulations, each grid cell may contain simulation results for each time step, resulting in file that can become unnecessarily large. By default, the information is saved in the binary files at the end of each stress period, and at the end of the simulation in the listing (.LST) file. The first two columns list the available stress periods and associated time steps for the entire simulation (only one stress period and time step will be listed for steady-state simulations). The remaining columns indicate the information which can be written and saved to the various MODFLOW output files. To select an output option, click in the appropriate checkbox and a checkmark (¸) will appear to indicate that the selected information will be written for the selected time step. The columns labeled Save to Binary will save the output information to the binary files as described below. •Heads: Saves the heads in the binary heads file (.HDS). •DDown: Saves the drawdown in the binary drawdown file (.DDN). •F.Term: Saves the cell-by-cell flow terms in the binary budget (.BGT) file. Note: The Zone Budget program uses the.BGT file for calculating the flow between zones. Therefore, to change the frequency at which the Zone Budget information is saved, select the desired F.Term intervals. The columns labeled Print to .LST will save the output information to the listing file as described below. •Heads: Saves the heads in the listing file. •DDown: Saves the drawdown in the listing file. •F.Term: Saves the flux terms (cell by cell flow terms) in the listing file. •Budget: Saves the budget information in the listing file. Note: MODFLOW only allows the flow terms (F.Term) to be stored once, in either the binary budget file (.BGT) or the listing file (.LST). Be aware that this setting can be lost if MODFLOW is being run together with MODPATH, because MODPATH requires the flow terms to be written to the .BGT file, and not to the .LST file. The checkbox labeled Save.FLO file will save the cell-by-cell flow terms required by MT3D/RT3D, when neither MT3D nor RT3D is being run at the same time as MODFLOW. For simulations with many stress periods and time steps, it can be very tedious to manually select the desired output time step intervals. 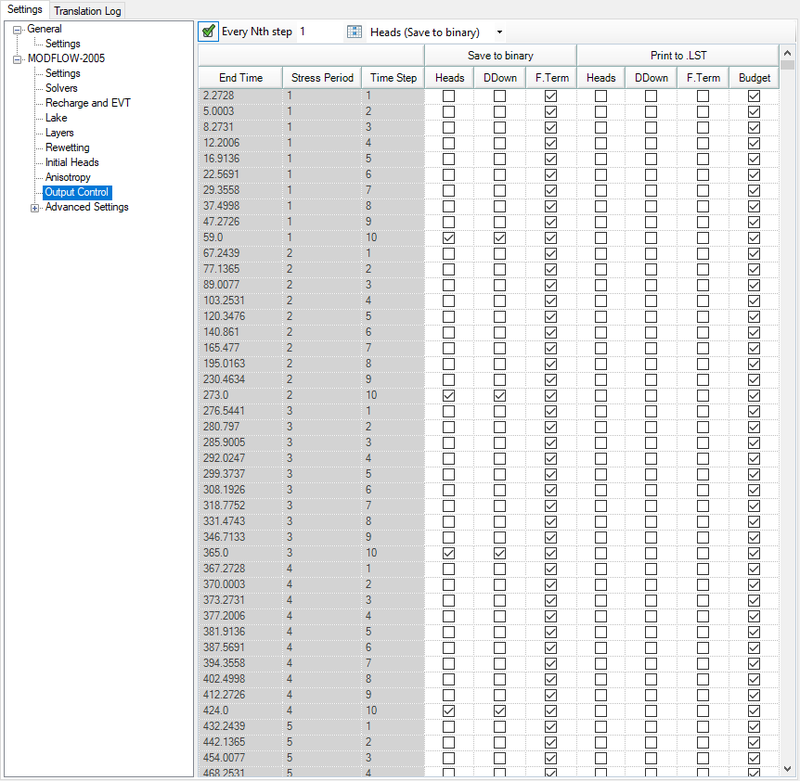 The row of fields underneath the Output Control table are used to specify regular time step intervals for saving files during Each N-th step in each stress period. The first text box is where the N value is entered. To apply this value to the column, click the underlying checkbox. If MODPATH is run with the MODFLOW simulation, Visual MODFLOW Flex will save the flow terms for all time steps.